Private transfer from the airport to your hotel, the Shangri-La Hotel. A luxury hotel that offers some of the most spacious and luxurious guest rooms and suites among Sydney hotels. Today, come aboard and experience what it is like to "cruise like a local" on one of the most spectacular harbors in the world, with your local, friendly Australian hosts. Your personalized, tailor-made, 4-hour Sydney Harbor cruising experience will give you the opportunity to swim, fish, kayak, relax or sunbathe, with fabulous sight-seeing opportunities. Included in your tour today is a gourmet Australian BBQ lunch, with regional wines & local beers, plus 5-star service. Travelling between the Indian and Pacific oceans for over 40 years, this truly is one of the world's great train journeys. From Sydney you will journey through the spectacular Blue Mountains and then through some of Australia's most productive farming country and into the arid outback to Broken Hill. The terrain continues on the picturesque city of Adelaide. During the day, the compact Twin Berth Sleeper Cabins offer a comfortable three seater lounge, converting to an upper and lower sleeping berth at night. Your journey will be made even more comfortable with service from our hospitality attendant including fresh sheets, bath towels, pillows and complimentary toiletries. Twin Berth Sleeper Cabins have private en suite facilities with a hide-away compact toilet, wash basin and shower. Includes meals in the stylish Restaurant Car, Lounge Car for relaxation and refreshments, a welcome reception with complimentary glass of bubbly, wine, beer or soft drink and complimentary tea and coffee available during your journey. ​DAY FIVE - WELCOME TO ADELAIDE! Adelaide, South Australia's capital city, is renowned for its compact size and accessibility. Colonel William Light's vision in 1836 saw the city streets designed in a grid pattern surrounded by parklands. This safe and clean city is only one square mile, yet boasts many distinctive attractions. Hilton Adelaide is ideally located overlooking Victoria Square, next to Adelaide's shopping, theatre and business centre. Wake up to the call of the native birdlife. Today we explore the unique area that surrounds the Pound. We visit the famous Bunyeroo and Brachina Gorges and view some of the oldest rock formations and fossils in the world. Wildlife including kangaroos, emus and the bold wedge tailed eagles are prolific in this rugged area. Travel back to Rawnsley Park via the spectacular Moralana Scenic track following the southwestern wall of Wilpena Pound. Our journey now takes us south through the magnificent Southern Flinders Ranges with its spectacular Red Gum lined creeks to Melrose ,the oldest town in the Flinders Ranges. Check out the historic buildings such as Bluey Blundstone's Blacksmith Shop. Leaving Melrose we travel through the old townships of Mid-North South Australia. On our way home to Adelaide you will have the opportunity to experience one of the best wine regions in South Australia - the Clare Valley. Here you can have a taste of the fine local wines and produce. Overnight at the Hilton Adelaide. Today you can swim with wild dolphins! This is possibly the only cruise of its type, where we don't go looking for dolphins; they come to us - something that has taken many cruises to achieve! An early morning pick up from your city hotel to the Holdfast Shores marina. Following a briefing on the day’s activities we cruise along the coast until dolphins are spotted. Your cruise across to Kangaroo Island. 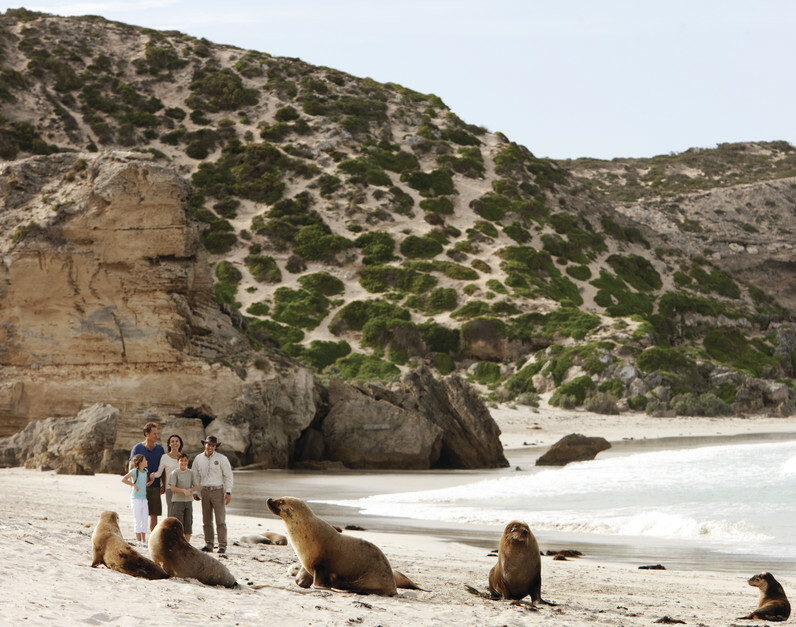 At Seal Bay, walk along the beach with a National Parks Ranger amongst a breeding colony of wild and rare Australian Sea Lions. Continue to the Parndana Wildlife Park where you can feed kangaroos, have your photograph taken with a koala, and take a guided tour of this wildlife and bird park. Your day concludes at the Island Pure Sheep Dairy, a unique and enterprising farm. Observe sheep being milked and sample delicious yoghurts and various sheep cheeses. Overnight accommodation at Kangaroo Island Lodge. This morning visit to Clifford’s Honey Farm to enjoy an informative talk by the beekeeper followed by tastings. Continue to Kelly Hill Caves to view the unique limestone formations, created over thousands of years. After a lunch we head on to Flinders Chase National Park renowned as a sanctuary for native Australian animals including kangaroos, wallabies, koalas and echidnas. Walk the rugged southern coastline to the Remarkable Rocks and Admiral’s Arch. See playful fur seals swimming and playing in the waves, or resting on the rocks. This morning you'll be transferred to the Kangaroo Island airport from your flight to Adelaide and then transferred to the rail station. The Indian Pacific gives you two oceans on one of the world's longest and greatest train journeys. But most of your cruising will be across the vast continent of Australia. The Nullarbor, where the train travels the world's longest straight stretch of railway track (478 kilometers), see unique landscapes unfold and spot a fascinating array of wildlife from the comfort of the lounge or your cabin. ​DAY FOURTEEN - WELCOME TO PERTH! Australia's largest state, Western Australia is famous for long days of sunshine and diverse landscapes and climates. Enjoy the beach lifestyle and natural parklands of Perth, one of the country's most beautiful cities and the capital of Western Australia. Overlooking the picturesque Swan River and only minutes from the city centre, Hyatt Regency Perth offers all the facilities and service expected of a luxurious, internationally renowned five-star hotel. Known as one of Australia's finest wine regions, the Margaret River Region is an area also blessed with natural beauty. Providing a diverse range of activities, this tour allows you to experience this high profile Western Australian area in one day. We journey to Xanadu Winery, one of the early established vineyards of the region. Experience a guided tour of Mammoth Cave, one of over 300 natural underground limestone caves in the district. 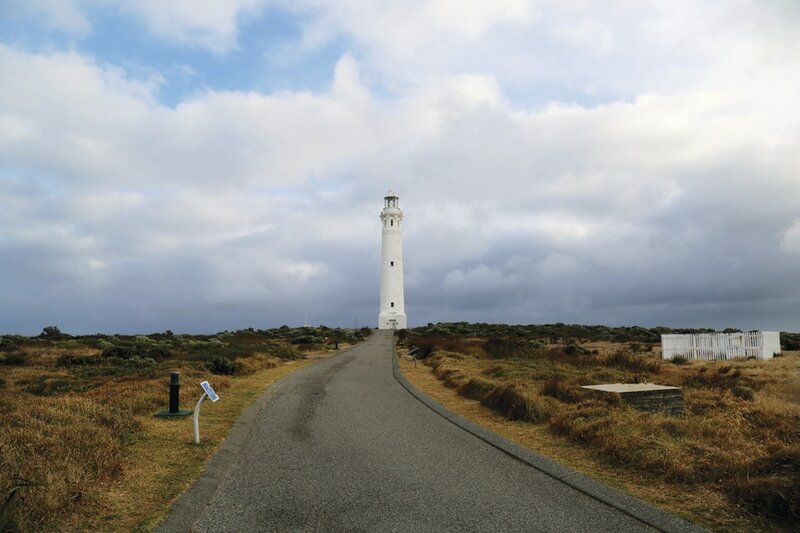 Traveling south we pass by stunning Boranup Forest, a visual highlight of the region before arriving at Augusta's famous Cape Leeuwin Lighthouse, a geographical point of significance marking the dividing point between the Southern and Indian Oceans. You'll be transferred to the airport for your flight home.